Mayday, mayday, mayday… is there anyone out there? Cherie O’Sullivan has been distinctly underwhelmed by her request to the 400+ members of the Friends of Lightwoods Park and House for volunteers to help out on Mayday in the park. Now…we all know you didn’t think you had to TELL Cherie you would be helping out, because, let’s face it, you always turn up on the day and offer to chip in if any help is required, and Cherie can rely on you. But, it would really help planning the event if you would drop her an e-mail and say what you can do, and when you can do it. You don’t have to do the whole day, an hour or two here and there will be fine. 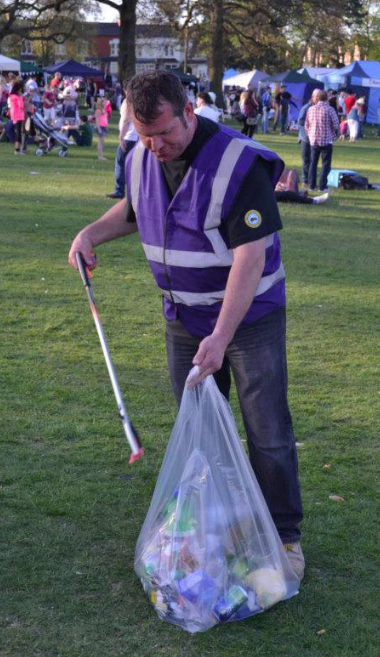 You can’t leave it all to folk like this poor old fella pictured here litter picking now, can you? Over the next couple of weeks you will read lots on here about the things happening on the day, but with the whole thing running on a shoestring budget, there are loads of things we require volunteers to help out with… and don’t forget, you get a free car park pass, and the possibility of a drop of ale or cider at the end of the event.